grass stains: What's the reel culprit hear? What's the reel culprit hear? 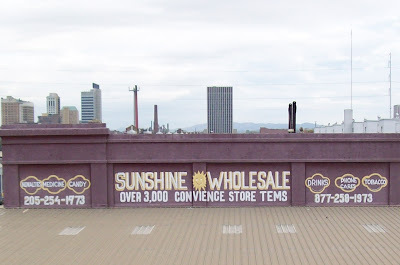 Sunshine Wholesale, which I've driven past twice a day for about 10 years, went out of business recently. Sunshine boasted OVER 3,000 CONVIENCE STORE TEMS, including NOVALTIES, MEDICINE, CANDY, DRINKS, PHONE CARES and TOBACCO. In what world is it more difficult to spell "cards" than "tobacco"? I never called the phone numbers to see if they were correct, but someone did, because the 9 in 1973 on the left-side phone number used to be a 7, and they painted a loop in it to correct it. (Click the picture to enlarge it.) Quite frankly, I've always been a little disappointed that there weren't any random, unnecessary "quotation marks" anywhere on the building. Because if you're going to be wrong, I say be BIG wrong. I wonder if it shut down because of the economy, or if it was the misspellings that did it in ... I don't know where I'll go to buy all of my phone cares and novalties now. Wow. I've never seen that before. But if I did, I would definitely blog about it. That is ludicrous! Or should I say ludikris? I bet you had fantasies about getting a spray can and correcting those misspellings in the middle of the night. It had to have killed a little bit of your soul every day to see that. Rachel, no kidding! Totally ludikris. Hey, I saw your comment on Amy Albert's page this week!